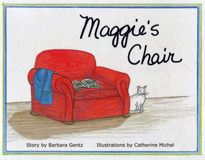 Barbara Gentz is the author of Maggie's Chair, a heartwarming story about a child who struggles to accept her grandfather's move to a smaller home. Life changes, but one beloved item stays with Grandpa - the big red chair where he and Maggie sit to read stories. Lovely illustrations by Catherine Michel are found throughout the book.